When Will Allen writes about the plight of struggling black farmers, and about black southerners who migrated north to be free of sharecropping, which subsequently led to the tragedy of shunning farming as “slave work”, he’s touching on themes and characters I’m incorporating in my novel, Peach Seed Monkey (in revisions). I thank my buddy Annie Spiegelman, aka The Dirt Diva, for loaning me this book, (more good research). Annie is Thelma to my Louise for school gardens, we volunteer a couple of days a week trying to re-connect high schoolers to the earth—the only source of real food. So yeah—Will Allen is our hero. Not only is he growing food in the inner city Milwaukee, but as a result, he’s growing jobs and community. We need to repeat what he’s doing over and over again to get America back to healthy eating and solve our epidemic problems with childhood obesity and diabetes. Thanks for posting. Would love to be his student. UNC Wilmington is partnering to bring rural small farmers in Eastern NC, many of whom are of African American heritage, together with urban public housing residents to market their produce….a win win situation. 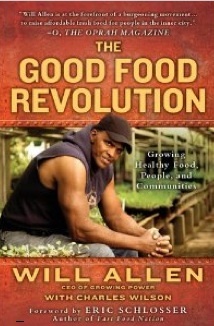 I want to read Will Allen’s book.